The culture war between the reformists and the traditionalists — all of whom care about the future of Australian cricket — continues apace. This time, Michael Clarke has climbed back onto the pulpit to tee off on Gerard Whateley. 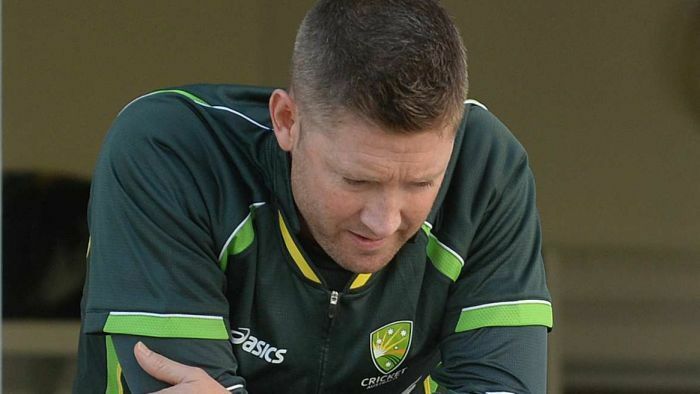 Clarke already had his turn earlier this week, taking aim at the new, softer direction suggested after the independent review in Australian cricket, sparked by the horrible scenes of sandpaper-borne ball tampering in South Africa. “Play tough, Australian cricket because — whether we like it or not — that is in our blood,” the former skipper told Macquarie Radio. Whateley suggested on his Melbourne radio show on SEN that Clarke missed the point and was the personification of the “gilded bubble” occupied by elite Australian cricketers that was flagged in the Ethics Centre’s recent review. Clarke couldn’t take this and hit back on Twitter, opening his statement with “Attn: Gerald Wheatley“. This was either an attempt at an ‘oh sorry, what’s your name again?’ powerplay by Clarke or a genuine mistake (although the latter would seem strange considering he used the correct name when tagging Whateley in the tweet). And while Whateley may not be on Clarke’s level when it comes to fame, forgetting the name of one of Australia’s most renowned sports broadcasters doesn’t do wonders for Clarke’s repudiation of claims he and other top cricketers live a step removed from the rest of the world. Clarke could have pointed out teams led by Mark Taylor, Steve Waugh and Ricky Ponting were also loaded with aggressive personalities. Or he could have made clear that he is not responsible for the actions of his former protege, David Warner, or his successor, Steve Smith. But rather than make his stand from those defensible positions, he opted to attack Whateley’s integrity as a journalist, saying the former ABC Grandstand cricket caller did not care about facts, proceeding to offer a few of his own. Unfortunately, what he offered up were not only largely not facts, but supplied some of the most crystallising evidence imaginable for Whateley’s case that Clarke simply doesn’t get it. So let’s break it down point by point. The first part is true and the second speaks to a genuine problem with sport journalism — it’s easy to ignore issues while a team is winning and easy to zero in on them too late once they start affecting results. The second part of the statement is very hard to believe, though. Considering Whateley’s tendency to speak his mind, it’s more likely criticism was there and Clarke just couldn’t or wouldn’t hear it. And, lo and behold, while it falls outside the parameters of the first 18 months of Clarke’s captaincy, which started in early 2011, here’s a tweet from Whateley in mid-2013 describing the team as “fractured”. This is arguably true (though we’ll get to the “by the rules” stuff in a moment) as the Australians were not the only team to resort to petty sledging at the time, but it’s also a pretty subjective argument because everyone’s personal “line” that cannot be crossed is different and therefore it’s tough to sell this as “fact”. OK, there’s A LOT in this one. Clarke can’t say ‘my conduct has never been questioned, except for that time that it was’ — once it’s questioned, sanctioned AND fined, you’re no longer allowed to use that as a crutch. Next, let’s be clear that sticking up for George Bailey was chiefly telling James Anderson to “get ready for a broken f***ing arm” while he was batting, which considering Clarke was the captain in charge of the most frightening bowler in the world at the time, Mitchell Johnson, is a straight-up physical threat. And lastly, why does Clarke think it’s ‘bullying’ when England’s number 11 batsman has some words to say to a short leg who won’t stop talking while he attempts to face up, but Clarke’s threat is (in his words at the time) mere “banter”? Could it be a bubble thing? This is correct. Clarke’s comments are his to own and no-one is taking that away from him. For a professional team and professional athletes whose livelihoods depend on performance, there are more important things than being liked. Unfortunately, “respect” is a funny old concept. You can respect someone’s ability as a cricketer while thinking they are an odious cretin, or respect someone as a human being but think they couldn’t bat their way out of a paper bag. That does not, however, mean you have to pick one or the other. Both are on a sliding scale. OK. That doesn’t really disprove the findings of the independent review that there was a poor culture that has been allowed to fester within the Australian cricket set-up. Also, Johnson, Clarke’s weapon of choice during that 2013/14 Ashes series and beyond, has said the dynamics changed when the New South Welshman took over as skipper in 2011, painting a picture of a fractured locker room (hey, just like that Gerard Whateley tweet from 2013 said!) and a “toxic” environment. Again, it’s not fact to say that Gerard Wheatley is a coward or has a tendency to chase headlines (not least because Clarke got his name wrong again). Even if it was true, this is an opinion. On the topic of cowardice, by Whateley’s admission, it was a lack of skill rather than courage that prevented him from taking to the cricket pitch. And while Clarke’s Cape Town century in 2014 was a moment of cricketing courage, there are umpteen number of ways to display bravery that have nothing to do with stepping onto a cricket pitch — although it would make sense that if someone was inside a “bubble” they may struggle to see that. And finally, suggesting the only way to understand cricket is to have played the game at an elite level just doubles (triples?) down on the public perception and the review’s findings that those in the upper echelons of the sport in Australia have separated themselves from the rest of the world, leading to a sometimes-warped sense of right and wrong. The lesson here is, whether threatening an opposing player on the field or lighting up the grill for some delicious Twitter beef, perhaps a more measured approach is the way to go, lest you accidentally prove your opponents’ point.